In April, Kristen Lovric presented a proposal of her MPhD research to the ACCELL research team. 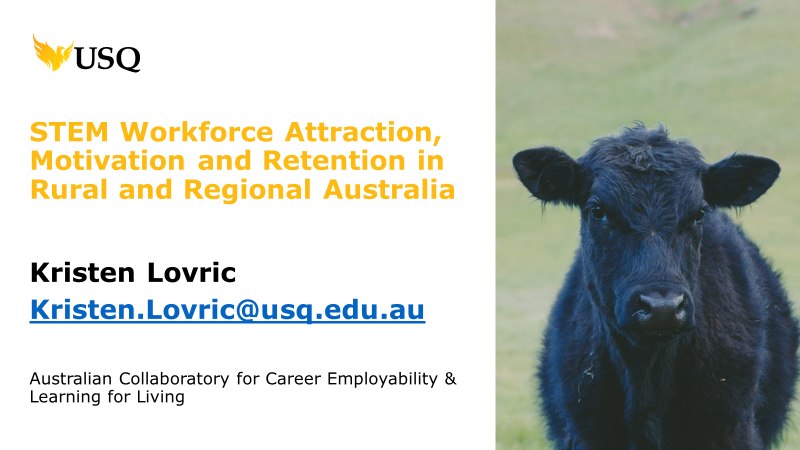 Kristen’s research is focused on understanding the factors that attract and retain agriculturalists to jobs in Australia’s agriculture industry. Kristen argued that individuals trained in science, technology, engineering, and mathematics (STEM) play an important role in innovating more efficient and sustainable technology for use in farming. Kristen is interested in understanding motivation and engagement of these trained professionals. First, Kristen investigates what leads these professionals to apply their skills in the agriculture field: Are agriculturalists driven predominately by their career interests? Then, she identifies and explores their key occupational beliefs, experiences, supports, or barriers that help or hinder their workforce engagement: What role does their confidence at work play?